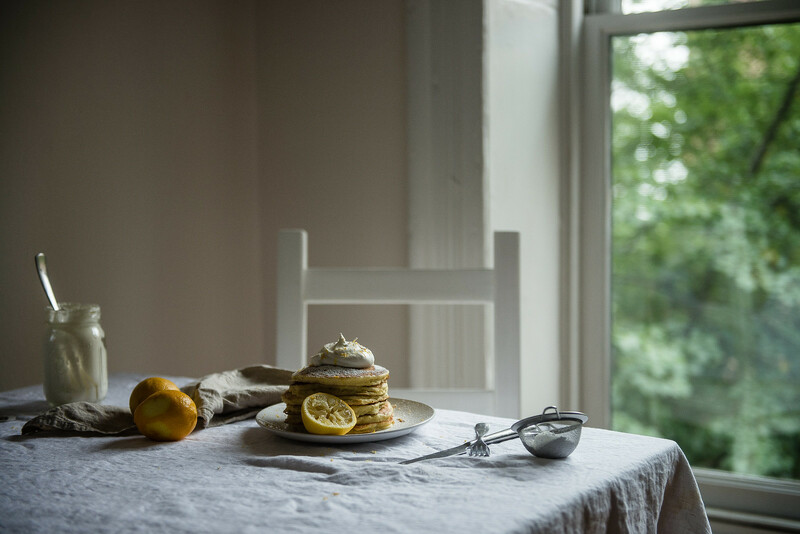 Lemon ricotta pancakes are as fluffy as their buttermilk counterparts, but the ricotta lends them a creamier, denser texture and flavor, while an extra egg adds a hint of custard to the mix. The “Meyer”-ness of the lemons is at its height when zested, and the extra zest on top is lively, yet sweet. But what truly stole my heart was the chamomile whip — the light floral notes from the tea add an irresistible buoyancy to heavy cream, even without any extra sugar. Whipped cream at breakfast (waffles!) always seems to add a touch of celebration to the whole meal, but this delicate chamomile confection takes it to a new level. The perfect start to a long weekend. 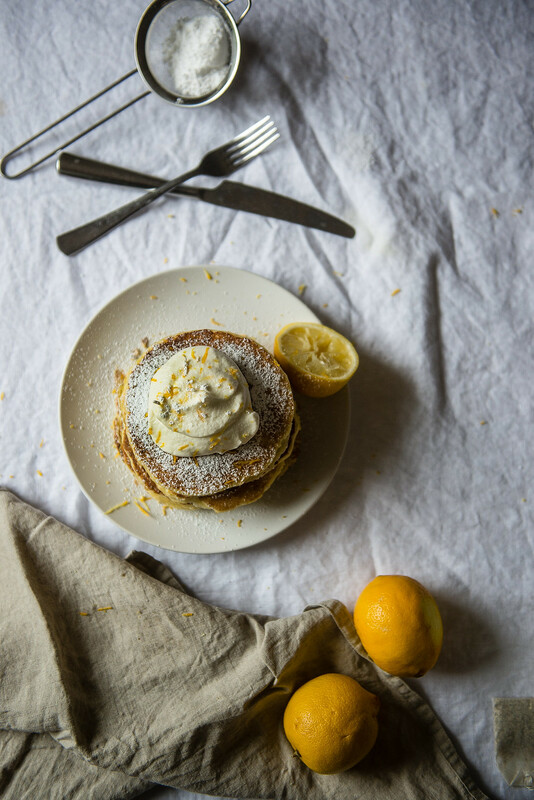 Meyer lemon ricotta pancakes, with chamomile whipped cream. Make ahead: The night before or several hours before, combine the cream and chamomile in a small saucepan over low heat. Just before it simmers, remove from heat and let cool for 15-30 minutes at room temperature. Remove the teabag or strain the chamomile out through a fine mesh strainer, squeezing the chamomile to extract the most flavor. Chill the cream in the refrigerator completely. Note that it should be completely cold for the cream to whip -- I did this the night before. Also, if you're making your ricotta at home, do this ahead of time as well. 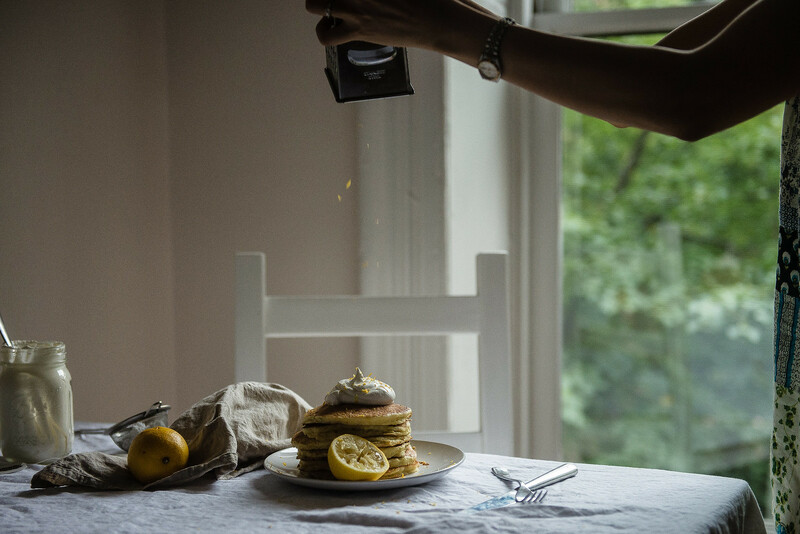 Right before you’re ready to make the pancakes, use an electric mixer or plenty of arm strength (or a Mason jar) to whip the cream to firm peaks, or your desired consistency. If using an electric beater, set the beater to medium or lower and take care not to overbeat (or else you’ll get butter!) Replace in the fridge while you make the pancakes. Optional: Add a teaspoon of confectioners' sugar to the cream after it reaches soft peaks for a hint of sweetness. I just saved it for the topping, but it's up to you. To make the pancakes, whisk together the flour, sugar, baking powder, baking soda, and salt in a medium bowl. In a large bowl, whisk together the ricotta, milk, egg yolks, lemon juice, and lemon zest. Fold the dry ingredients gently in the wet until just incorporated and small lumps remain. If batter is too liquid, sprinkle a few more tablespoons of flour over the mixture and mix very gently again to incorporate. In a small bowl or cup, whip the egg white with an electric beater (or, again, with plenty of arm strength) until it reaches medium peaks. Fold the egg white very gently into the pancake batter until only partially incorporated, leaving wisps of egg white visible. Heat a pat of butter in a cast-iron skillet over medium-low heat. When a drop of water sizzles in the pan, you're ready to cook. Using a 1/3-cup measuring cup, drop batter onto the skillet (you may need to spread it a bit with your cup to form a circle). When bubbles pop on the pancake and leave a momentary hole, flip the pancake to cook the other side. Let cook for 1-2 more minutes, then remove and set aside. (Optionally, store the pancakes on an oven-proof plate in an oven set to its lowest temperature to keep the pancakes warm.) Repeat until batter is all gone. Serve with plenty of chamomile whipped cream, lemon zest, and confectioners’ sugar. 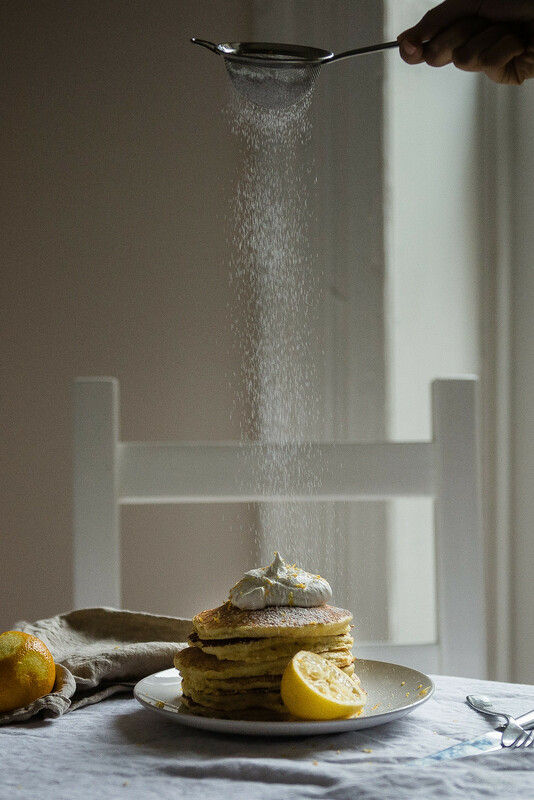 Whether or not you add the confectioners' sugar as a last touch on top or in the whipped cream itself, don't omit it -- I thought a touch of sugar was key to bringing together the floral notes in the whipped cream and the creaminess of the pancakes. Dude, same here, except instead of giant fur balls it’ll be giant balls of my hair, which is… maybe not what I should be disclosing on a food blog. Tasty. Also, I really want to try making your fat sparrows! I drool about them whenever I think of maximally floofy-soft pancakes. Second also, I was definitely going to call them “fat pigeons” until just now when I listened to the twinge inside me that said “that doesn’t sound quite right…” & looked it up on your blog. Cynthia, you have got a definite way with pancakes, my friend. Erry time I see a pancake recipe on my blog, I can’t stahp staring at it! These are no exception – totally glorious, as always. Your Fourth sounds fantastic. And because ours was nothing like that, Imma make up for it this weekend starting with a big stack of these pancakes. YUM. These sound absolutely divine! 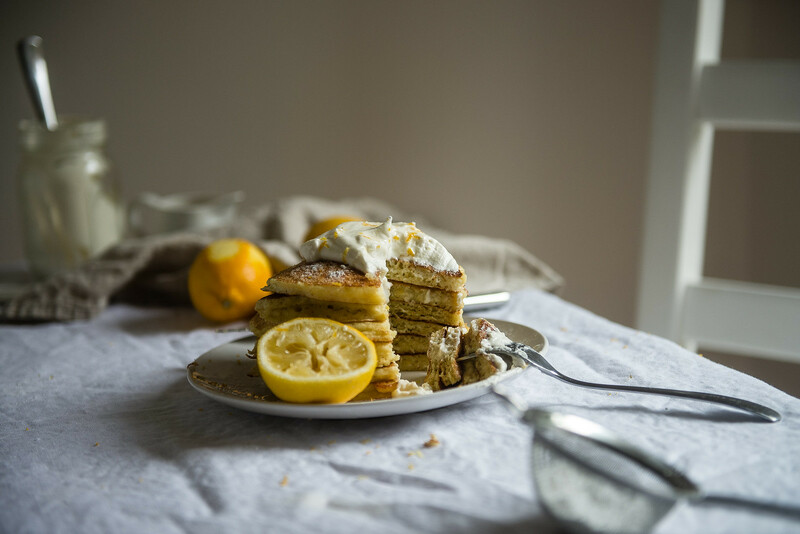 Love the pairing of meyer lemon with the ricotta pancakes! And those pictures!! Wishing my 4th and today would have started with these. 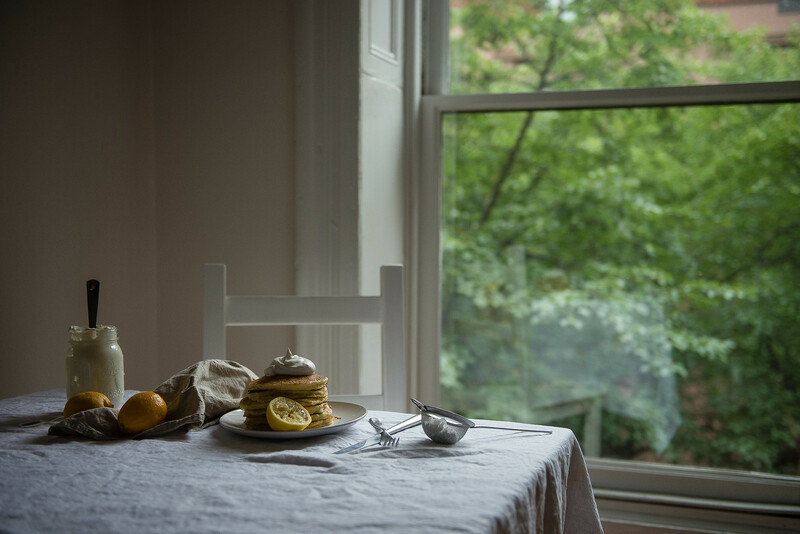 I love lemon ricotta pancakes, but yours just look so perfect/ The photos are gorgeous and I love your cute little window! chamomile whipped cream? CHAMOMILE WHIPPED CREAM?!!!!!!!! Yes!! They do have that hint of cheesecake-y dessert decadence … I looove that. Thank you so much, Belinda! One of my favorite brunch spots here in SF, Plow, does a really good lemon ricotta pancake but these sound better! Chamomile whipped cream seals the deal for sure. Looking forward to a no work and no grand plans day! Oh, these pancakes are so totally dreamy. 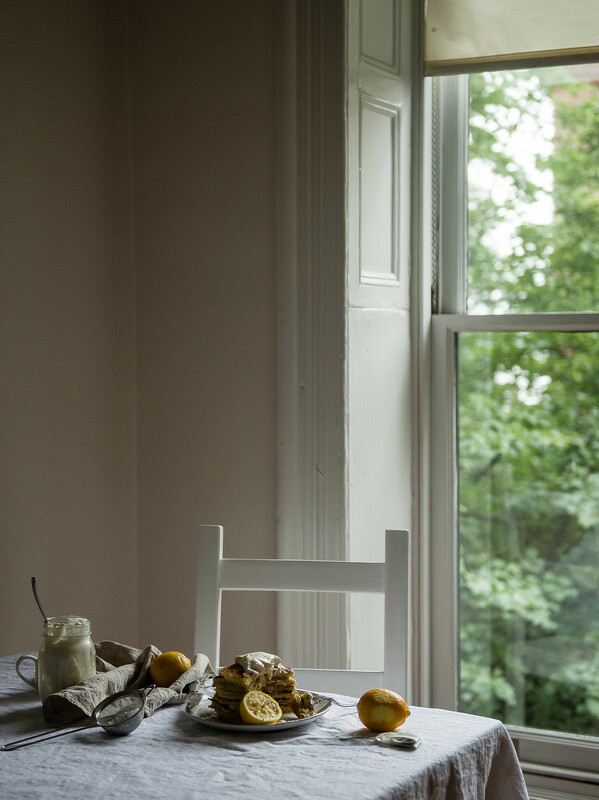 I love that morning light and the sense of peace + calm you’ve captured in your photographs; the perfect way to start a holiday day. Me too! :):) Thanks for stopping by! OMG you have such a way with chamomile. And flavors in general. Having you and Lindsey both in my place would be such a dream!!! <3 Thank you so much for your kind words always, Erika! CHAMOMILE WHIPPED CREAM?!! Mind blown! These are absolutely stunning! I had your Earl Grey whip on my mind, Michelle!! I totally agree with Kathryn, these pictures are so incredibly calming! I feel like I can smell and hear everything that is going on in this picture. 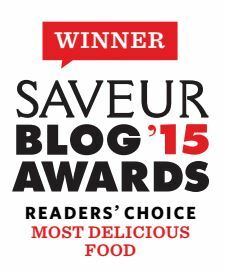 Seeing an image like this makes me so exciting to get into the kitchen right away! Your work is so inspiring friend!! Wow, I think I will have to go grocery shopping this weekend to make these pancakes. Looks so delicious! You had me at chamomile whipped cream!! looks heavenly! and the photos are always amazing! and i love that you get to squeeze in video games 🙂 i love playing games with my husband too! i’m loving your new home cynthia! the light is so gorgeous. so happy that you and bowl 2 got to slow down and savour your morning with these pancakes. i absolutely LOVE ricotta pancakes. and i have some ricotta in the fridge right now…these guys are definitely calling my name! These pancakes look so good. I agree, any day that starts with pancakes is sure to be a good day! I love your photography too! These sound really amazing – how cool is that you found nifty fresh meyer lemons in your ‘fridge? The only interesting thing that happened in my apartment is the hand soap disappearing from the counter…. And you have TREES! I’m so jealous. craving a stack of these pancakes now.. love it! great idea to use ricotta.. i can imagine how good they would have tasted. definitely a recipe i will be saving to recreate in my kitchen! That powdered sugar shot reminds me of a perfect rainy sunday in. 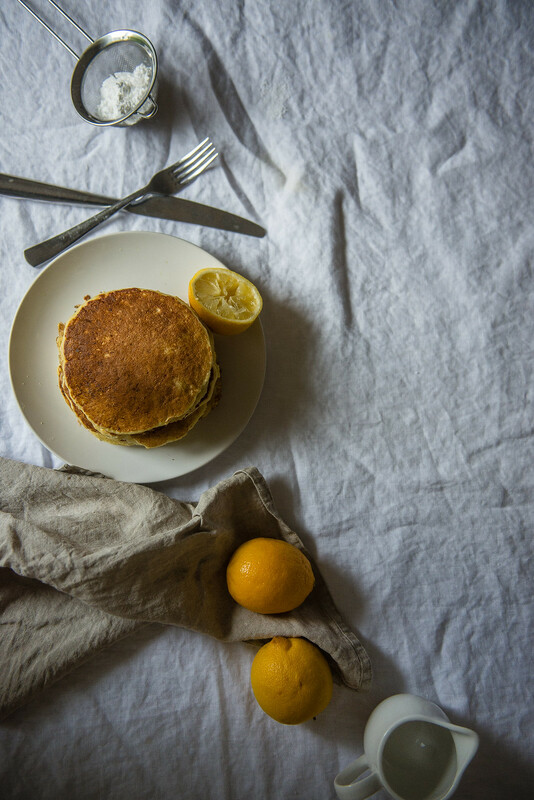 One of my gals makes meyer lemon ricotta pancakes and they are so fluffy I want to make a blanket out of them and take a nap with their aromas surrounding me. You know, totally normal food activities. I bet yours are at least that yummy. Your action shot of the powdered sugar is giving me food photography feels. For real. I love meyer lemons in anything and chamomile whipped cream is such a thoughtful and classy touch! I would like to dive face-first into that stack of pancakes! Now I will be dreaming of chamomile whipped cream for the rest of the evening. Love love love these photos esp. that levitating shred of lemon zest catching the light! Gorgeous. So, uh, did they also leave behind a collection of drop dead gorgeous photos to go along with said lemons, or is this just you being awesome all over again? I think you’ve created the stack of my dreams. 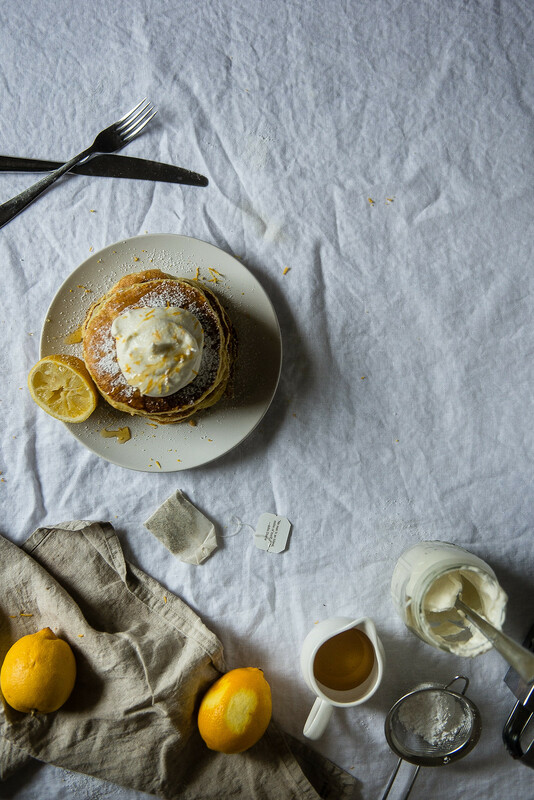 Ricotta pancakes in all its fluffy, creamy, amazingness is my favourite thing to wake up to! Your stacks look incredible with the perfect dollop of chamomile cream! And that shot of the icing sugar being sieved is pure magical. I’m totally amazed by that chamomile cream! Will I ever want my whipped cream any other way? So simple yet so genius. Also, these pancakes look luscious; the perfect way to start a day. I always get a bit sad when people post Meyer lemon recipes as they can’t be found here in Scandinavia… Or at least I’ve never come across them. They flavor must be amazing. Another reason to visit the US again. P.S. Love the feeling in these pictures! oh my these look so fluffy! I need them in my life asap! What lovely pancakes, they look so perfectly fluffy and that whipped cream is dreamy! i am loving those pictures, so dreamy!! I’m dying over how pretty the light in these photos is! I can’t express how incredibly jealous I am that you have Meyer Lemons IN JULY! That doesn’t happen down in Texas a.k.a. the produce wasteland. Such a lovely post, Cynthia! I could feel every relaxing moment that you and Bowl #2 shared that morning. You guys deserve it! And a big yes to video games. I derived so much enjoyment from my old Nintendo console and Gameboy as a kid. These photos are beautiful as usual – I just love the scene you set up and the incredible lighting. I just want to step into my computer screen and have a seat at your table, with a giant stack of pancakes and chamomile cream, of course! Hi Cynthia, I have had pancakes somewhat similar and always wanted to re-create them, you have made these into quite a masterpiece, love your whip cream! Pinned! The picture with the powdered sugar cascading on the pancakes! I visit A LOT of food blogs and that is the most striking picture I’ve seen in a while…and I don’t even like pancakes too much haha. Lovely lighting/photography/everything. 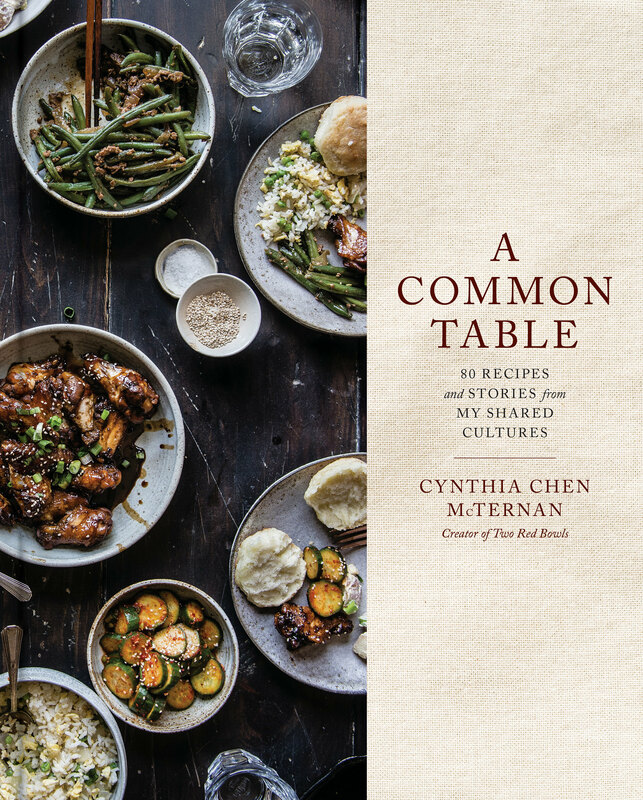 I love the photos and this recipe looks amazing. You are so talented! Pancakes for dinner!!! I have to try these pronto! gah! that whip sounds so good!! well, the whole shabang does, actually. yum! Omgnesss….all of my favorite ingredients put into ONE!!!! And your photography is so natural and beautiful! Love how it stands out with its “natural” setup. Wow! Stunning photos and that sounds like a breakfast fit for a queen. Chamomile whipped cream sounds heavenly! I love that idea! I always chuckle when you say “Bowl #2” – so cute. I usually am not a huge floral flavor fan, but I LOVE ricotta pancakes and totally see that combination! What I really need to know though, is how you get your pancakes to cook SO EVENLY. I only just stumbled upon this post Cynthia and these pancakes look so dreamy! Chamomile is such a wonderful delicate flavour – I love it with pears and strawberries (in fact I only just typed up a recipe with chamomile and strawberries last night) but have yet to try it with lemon. And yet, it sounds such like such a no-brainer (I actually think chamomile tastes a bit lemony). I am with Sini though in that it is so sad you cannot get Meyer lemons here. These sound absolutely divine, perfect for Sunday breakfast. Lucky for me that’s tomorrow! Delicious photos, love lemon flavoured things!